The documentary, filmed over a five-year span, is part of a larger exhibit titled “The Fellowship of Rev. Clay Evans,” currently on display on the library’s ninth floor. The exhibition, sourced from the library’s recently opened Rev. Clay Evans Archive, invites the knowing and the curious to rediscover and study the extensive influence and history of Evans. Upon arriving at the theater, glowing smiles could be seen throughout the space, greeting one another as audience members took their seats. Though the reverend was ill and unable to attend the screening, it was clear early on that this night was going to be special. The event was a celebration and a fine example of celebrating a person’s legacy while they are still around to enjoy it. The energy of the evening mirrored Evans’s charismatic personality. Born in Brownsville, Tennessee in 1925, Evans left the Jim Crow South and traveled to Chicago in 1945. By 1950, he was ordained as a Baptist minister and in 1952, cofounded the Fellowship Baptist Church. Showcasing conversations with Chicago public figures including Nation of Islam Minister Louis Farrakhan and former mayor Richard M. Daley, the documentary illustrates the impact of a man who is known for fighting for social justice and equality outside the walls of the church, pioneering broadcast ministries, and leading the Fellowship Choir to international acclaim. A natural leader and fearless in the face of adversity, Evans’s advocacy for social justice shifted the mindsets of the African-American congregation by encouraging parishioners to deviate from their concerns of personal salvation and motivating them to become active agents of change in their communities. His alliance with Richard M. Daley reshaped the way white Chicago politicians viewed the Black church by bridging the gap between City Hall and clergy, encouraging both parties to find ways to work together. 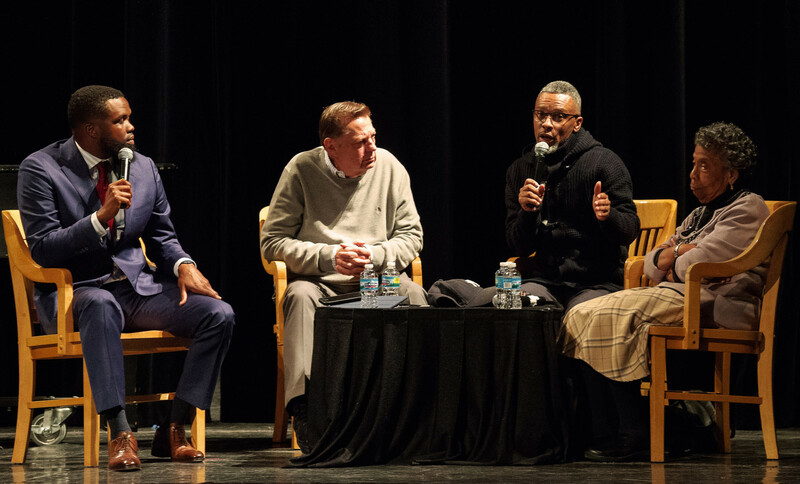 Following the screening, local clergy members—including Dr. Lou Della Evans-Reid, Evans’s sister and Fellowship Baptist’s former Minister of Music; Father Michael Pfleger of the Faith Community of Saint Sabina in Auburn Gresham; and pastor and gospel star Elder DeAndre Patterson—took part in a lively panel discussion. The panelists’ love, respect, and admiration of Evans shows the lasting impact of his ministry. An edited version of It Is No Secret will air on WTTW this spring. “The Fellowship of Rev. 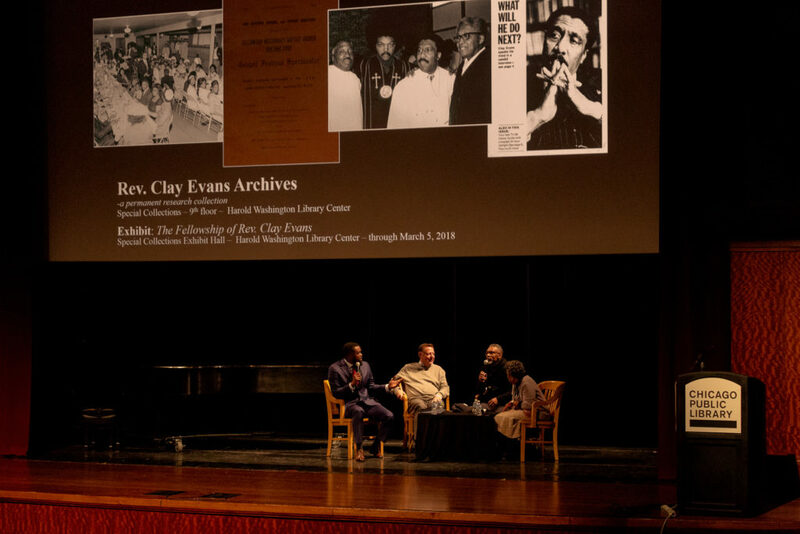 Clay Evans” exhibit will run at the Harold Washington Library Center through March 5; the archives the exhibit is sourced from are available to the public at the library’s special collections by appointment. Thanks for covering an event honoring such a wonderful man! Thank you for your comment, Zach! I agree, Rev. Clay Evans is absolutely wonderful and I learned so much while working on this article. Thank you, Much Obliged, Ta Ta. What a blessing, thank God for Reverend Clay Evans. Bless you Rev Evans for ALL your selfless devotion towards helping others, and by the power of the Holy Spirit working thru you all that you have managed to accomplish. You are truly an inspiration for this sheeple. of Kennedy King class of 99 – I was truly ‘blessed’ by the experience. I hope to visit this Spring.